Automation in business is much more than just a buzzword, it’s the future of seamless, easy workflows. What once had to be done manually with multiple steps, now can be completed with automation. This enables professionals to be more productive and focus on being strategic, instead of being bogged down by time-consuming tasks. You can achieve this by automating conditional workflows with Zapier Paths. 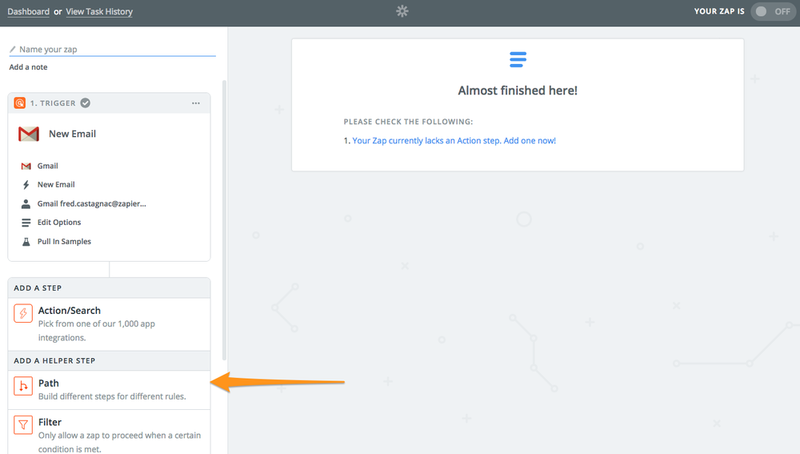 Zapier Paths, a tool that allows you to safely traverse conditional workflows, is an easy-to-use resource that could make all the difference. A conditional workflow is one that is based on dependencies. These dependencies relate to the possibility of multiple outcomes. There are typically different rules that route the workflow to the next step. They can be tricky to create without the right tools. Consider conditional workflows in this context: If “A” happens, the workflow branches to one activity, but if “B” occurs it goes to another. For example, an email campaign may have multiple workflows, depending on if the receiver opens the email or clicks on a link in it. When thinking about your business and all the many workflows necessary, you probably can conclude that without conditional workflows, you’re stuck managing activities manually. If you could map out the ideal workflow, you’ll probably notice there are many decision branches. With conditional workflows, you have the opportunity to manage how data is received and responded to within a system. Develop a strategy as to how these workflows can be automated—draw it out on a whiteboard to start. Now that you have a strategy for your conditional workflows, it’s time to use the tool that makes everything easier. As noted, conditional workflows can be challenging to set-up. 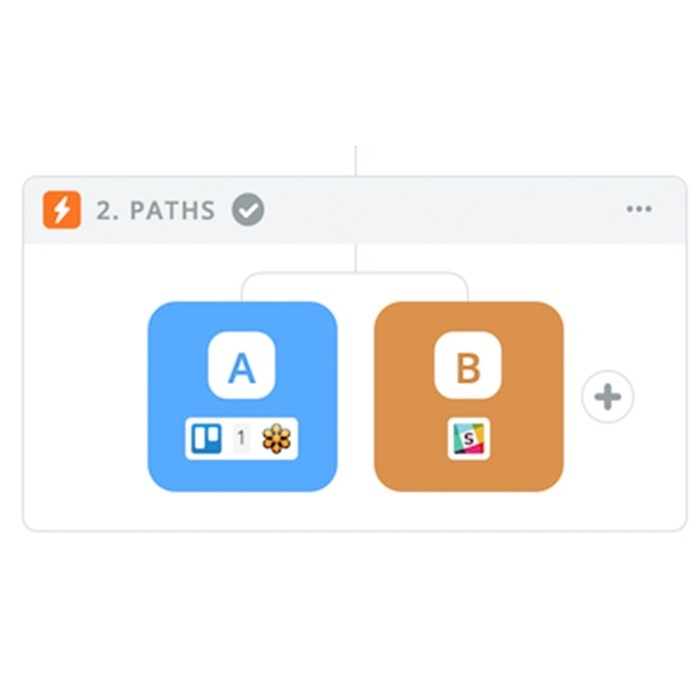 With Zapier Paths, you can build multi-step workflows with one Zap. Depending on the data received, the workflow path will change. Then you can automate certain tasks that don’t really need human intervention. Create a path to reply to messages, which could mean a blanket reply or assigning them to a specific person for response. Another example would be using a path to automate activities like sending customers emails when their purchase has shipped or providing them with a tracking number. With Zapier Paths, you don’t have to spend time coding these workflows, which can lead to long development, which isn’t going to bring efficiency to your processes. You’ll enjoy the ease of setting up a path. Create paths to route data from apps to multiple situations. Set up your “trigger” app then select “Paths” from the sidebar in the Zap platform. Next, determine your conditions. These rules can be customized to just about anything. You have the option to choose the field, condition, and match text. Then, you can add more paths if your workflow is more complex. Each path leads to a different outcome. Before the introduction of Zapier Paths, you would have needed to build several Zaps to accomplish this workflow. On the Zap app automation platform, you have the ability to connect over 1,300 apps, including workforce tools like Ontraport, Clickfunnels, HubSpot, Slack, and ActiveCampaign, to name a few of the most popular. The greatest benefit to Zapier Paths is that anyone can set one up—you don’t have to be a coder or IT expert. With the intuitive interface, you’ll be able to set multiple conditional workflows up in minutes (instead of waiting for your software team to make it happen). Another advantage is that you can easily make changes to your workflow as needed. This flexibility means you aren’t stuck with reinventing the wheel every time you want to edit the workflow. Want to see how easy it is? Start by signing up for a free Zapier account then test drive the paths feature for up to two weeks. Break free of complicated workflows and simplify with Zapier today.